KIDAPAWAN CITY, Philippines (Mindanao Examiner / October 7, 2009) – The Philippines Department of Agriculture said coconut oil prices continue to fall and lingering uncertainties in global financial markets, steep decline in crude mineral oil prices, and lower Asian vegetable oils markets added to the woes of Filipino farmers. In Luzon Island, copra prices went down from P 28.25 per kilo in 2007 to P 24.75 in 2008. This rapid and steep decline in prices is worse in the Visayas and Mindanao regions, averaging more than P 7 of decline within a year. The Philippine Coconut Industry said given this bare situation, farmers are no longer harvesting coconuts. 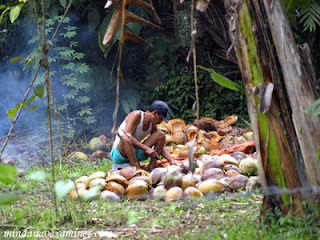 More farmers cut trees and sell them as lumber, instead of harvesting the coconut. coconut exports, dominating 59% of the global market.